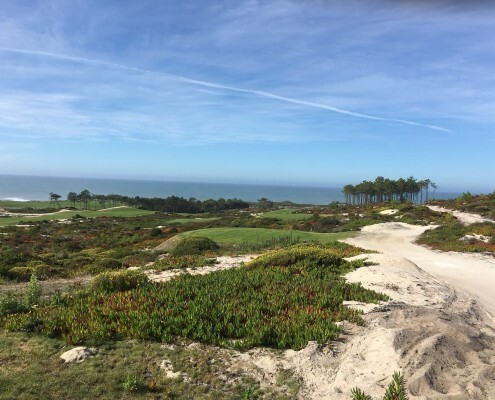 The dream began to take shape on the second fairway of the stunning Praia D’El Rey course, just an hour or so north of Europe’s ‘in’ city of Lisbon. The first three-ball in the annual 50’s outing took note of the huge villa with views to the Atlantic Ocean to the front and the galloping green to the rear. Before a 60 degree approach shot was hit in anger, the plan began to formulate. It was, we decided, the perfect clubhouse for a society that began life when the first of our group hit 40, some 14 years ago now. And the funding was going to be the easy part – the Euro Millions jackpot was a whopping €190 million that night and we were going to win it. Back in the buzzing PDR clubhouse we discovered that the six bedroom villa in question was on the market for a mere €1.3 million, loose change once we lodged the jackpot to our joint account. The house – and the private jet we were also going to buy – would allow us to make regular visits to Portugal’s Silver Coast, scene of our good fortune and home to some spectacular golf. And somehow we’d break the bad news to the ever helpful Ross and the team back at Golfbreaks.ie that we no longer needed their services. Alas, that dream didn’t come to fruition. The jackpot wasn’t won that Friday night as we ate sea bass and golden bream in the wonderful Xakra restaurant down the coast in Peniche. A week later a fortunate Spaniard won our €190 million and we were left to dream new dreams. Back in Ireland at this stage, our WhatsApp group lamented the loss of our ‘frat’ house in Praia D’El Rey. But we did agree that we’d happily return to Silver Coast again to sample the heady cocktail of excellent golf, great food and a wonderful Marriot hotel on site at PDR. The four day trip, over before it began as they always are, was the perfect escape from the first days of an Irish October and the onset of winter. Our journey commenced with a hassle-free Aer Lingus flight to Lisbon and an arrival time early enough to sample the delights of Pestana’s enticing Beloura track just outside the heritage town of Sintra. It was the perfect opener to our four day-four game flying visit to one of golf’s unheralded but great regions. 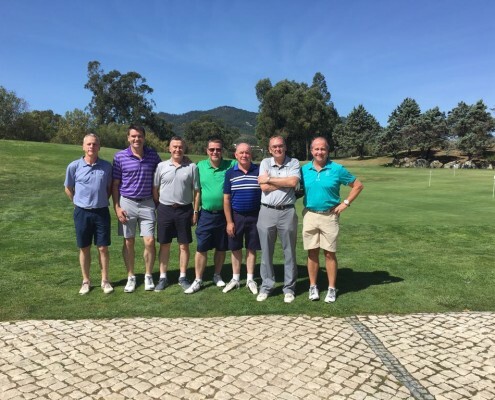 Director of Golf Vitor Paixao and his team couldn’t do enough to welcome us to their course with its inviting fairways and testing greens. All agreed it was the ideal opening round to our annual jaunt. That night we drove north to Praia D’El Rey and checked into the Marriott, a great hotel with luxurious bedrooms, lavish breakfast buffet and wonderful views. The only downside was their insistence that the bar closes at midnight and there’s no resident’s option, not something that is going to work for Irish groups as we explained more than once! The other issue they have at PDR is the sea-mist. Our game on their links-style course the next day was somewhat spoiled by the fact that we couldn’t always see that far in front of us, particularly on some of the spectacular holes down by the coast. It is a weather issue in these parts that you won’t read about in most other course reviews but it didn’t spoil our enjoyment of the Cabell Robinson designed par 73 lay-out. Next up was the Seve Ballesteros designed Royal Obidos, just a seven minute drive from the hotel and a real treat. 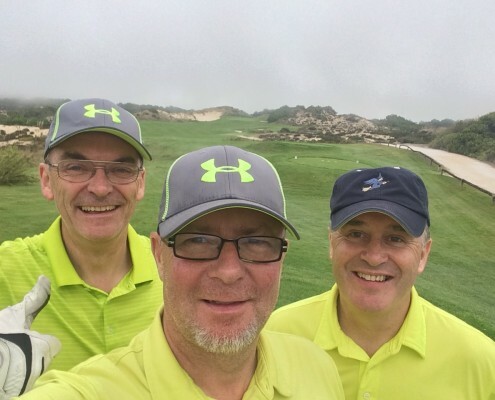 It is long and a buggy is desirable but it is also a great test of golf, probably the group’s favourite course of the four we sampled in terms of challenge and design. 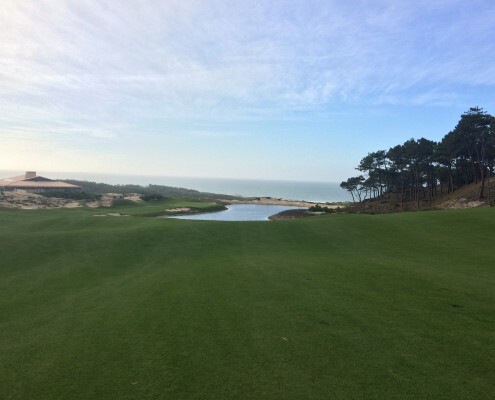 Playing the 11th at Royal Obidos you get to glimpse into the new West Cliffs course next door – and what a course! Only open two months when we played it – and already in the top 25 rated courses on continental Europe – this was a golf test and a half. Essentially you have three surfaces to play on at West Cliffs – grass, sand and natural flora. Hit the grass, narrow and all as it is in places, and you will be fine. Hit the plentiful sand lands and your next shot is solely dependent on the lie. Hit the flora? Prayer is probably the best option. West Cliffs is going to be a great championship golf course for really good golfers. Everyone else should try it at least once, the setting and the scenery alone demands that much. As a 15 handicapper it was difficult to say the least but that said, I would love to play it again. Knowing your way around would make a big difference. Regular visitors will know that no trip to Portugal is complete without fish, steak, Alentejo or Douro wines, Superbock and Sagres. We sampled all the above with meals for seven, including drinks, ranging from €210 to €370. There’s a great little restaurant/bar called Lavrador just outside the entrance to Praia D’El Rey that comes highly recommended. Alcaide in the wonderful walled city of Obidos was as good as James from Tipperary said it would be. Xakra in Peniche is up there with the best seaside fish restaurants in Portugal and Moo in Ferrel was a meat lovers dream. None of them broke the bank and all passed the tests presented by seven ravenous Irishmen in their 50’s. To conclude, the Silver Coast was a perfect destination for us as a group – Silver by name and gold medal on delivery.